An Evening with Neil Burger: THE UPSIDE at The Avon. The Avon welcomes director Neil Burger for a post-film Q&A! Pre-film Wine & Cheese Reception at 6:00 p.m.
Members-Only Sneak Preview Screening of THE UPSIDE at 7:00 p.m.
To purchase tickets to this Members-Only Sneak Preview, or to become an Avon member now, please call the Avon business office at (203) 661-0321 or visit the box office during showtimes. 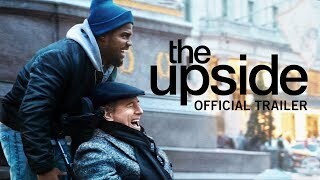 Directed by Neil Burger, THE UPSIDE chronicles the unexpected friendship between Phillip Lacasse (Academy Award ® nominee Bryan Cranston), a Park Avenue billionaire left paralyzed after a paragliding accident, and ex-con Dell Scott (Kevin Hart). Newly paroled and in desperate need of a job, Dell uses his irreverent charisma to charm Phillip, who, despite protests from his chief-of-staff Yvonne (Academy Award ® Winner Nicole Kidman), offers him a position as his home aid. From worlds apart, Phillip and Dell form an unlikely bond, bridging their differences and gaining invaluable wisdom in the process, giving each man a renewed sense of passion for all of life’s possibilities. Neil Burger’s feature directing credits include the 2014 hit DIVERGENT, starring Shailene Woodley and Kate Winslet, which has grossed over $300 million worldwide; LIMITLESS, starring Bradley Cooper and Robert De Niro; and the critically acclaimed THE ILLUSIONIST starring Edward Norton and Paul Giamatti. He made his directorial feature debut with INTERIVEW WITH THE ASSASSIN, which he also wrote, winning the Best Feature Film category at both the Woodstock Film Festival and Avignon Film Festival, and receiving nominations for three Independent Spirit Awards. Burger also wrote and directed THE LUCKY ONES, starring Rachel McAdams and Tim Robbins. On television, Burger directed and executive produced the first two episodes of BILLIONS, the Showtime series starring Paul Giamatti and Damian Lewis. He also executive produced CBS’ television adaptation of LIMITLESS. A native of Greenwich, CT and a graduate of Yale University with a degree in fine arts, Burger resides in New York City with his family. He is currently in pre-production on the film adaptation of SHOOT LIKE A GIRL based on the memoir by Purple Heart Veteran Mary Jennings Hegar.